Himalayan monks will create a Buddhist sand mandala, as a prayer for peace and compassion, over a three-day period at the Storrier Stearns Japanese Garden. Visitors are invited to watch them at work during the garden’s open hours of 10am to 4pm, on Wednesday, Thursday and Friday, September 26 -29. The event will take place in the center of the garden’s En Gallery of Art. Guests are also invited to the Dissolution Ceremony during which the monks will deconstruct the mandala that they have spent days creating–a lesson in the impermanence of all things. The ceremony will take place on the morning of Open Day Last Sunday on September 30 at 10:30am. 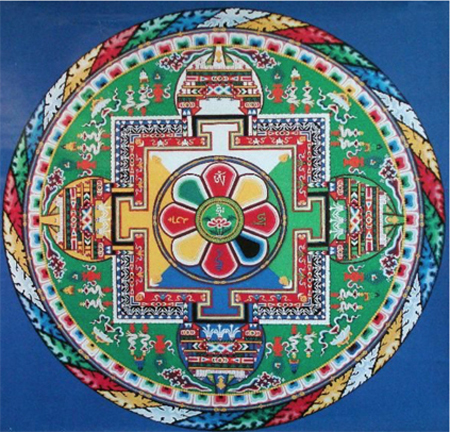 A mandala is a Buddhist cosmological diagram that represents the enlightened realm of a Buddhist deity. It can also represent the world in harmony. Sand mandalas are a particularly powerful type of mandala, as they are constructed using millions of particles of sand that symbolize the potential for all beings to live together in harmony and peace if we all create more space for each other in our hearts. It is said that when a sand mandala is created, all sentient beings and the surrounding environment are blessed. All who view it experience joy and peace. This special event is part of the monks’ 2018 Great Compassion Mandala Tour of the United States to raise awareness and funding to support the Ngari Institute in the Himalayan kingdom of Ladakh. In the Buddhist tradition, both the act of creating a sacred image and the act of making an offering to those who create such imagery are good karma that help us all attain spiritual merit and a higher rebirth. All proceeds from the monks’ tour will serve the children of the Ngari Institute. For more information about the Himalayan monks who will be visiting us, please see www.ngariinstitute.org. Viewing of this sacred ceremony is free with garden admission. However, we do encourage our visitors to make a donation to the monks for sharing this ceremony with our guests. Reservations for admission may be made here.